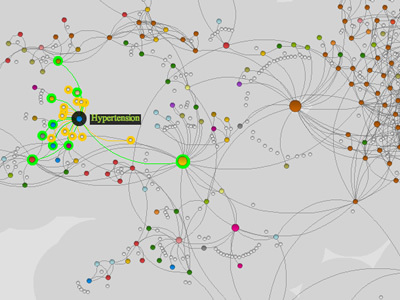 The diseasome website is a disease/disorder relationship explorer and a sample of an innovative map-oriented scientific work. Built by a team of researchers and engineers, it uses the Human Disease Network dataset and allows intuitive knowledge discovery by mapping its complexity. This kind of data has a network-like organization, and relations between elements are at least as important as the elements themselves. More data could be integrated to this prototype and could eventually bring closer phenotype and genotype. This website initiative is an invitation to think about the benefits of networks exploration but above all it tries to outline future designs of scientific information systems.